When I looked out of my office window this morning I noticed somebody had a left a great big yacht outside 500 building. It is still there, nobody towed it and I didn’t see any parking tickets on it, so I assume Larry parked it there. I wonder if it’s his new ride to work; anyone can show up in a Porsche 911, Ferrari Testarossa or Toyota Sienna but if you really want to turn heads park your 62 foot Americas Cup yacht outside the office. I was curious to check it out so I did my lap of the lake. 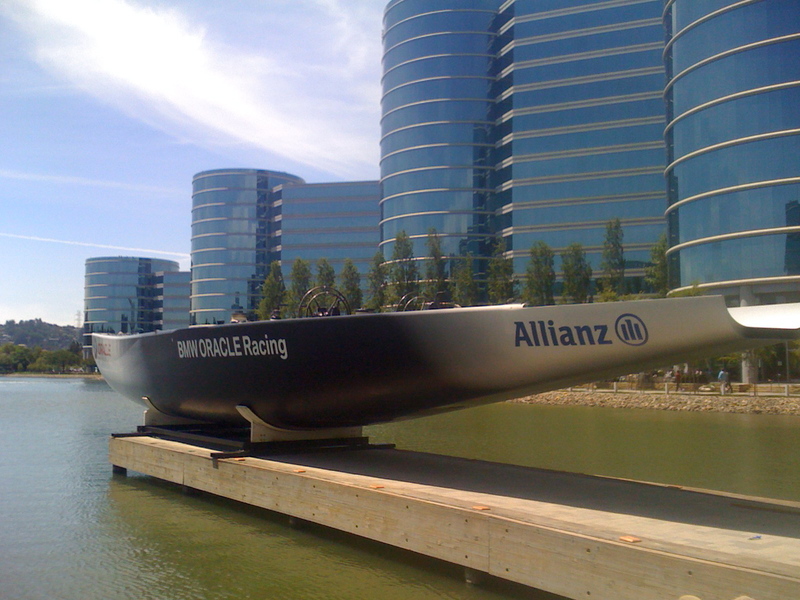 If you have ever been to Oracle HQ you will have observed this phenomenon, we all like to walk around the lake after our lunch and this week there has been a bit of a crowd near the Yacht, I was one of the sad characters taking photos. Did I hear right that it was flown in by helicopter? Larry doesn’t fly helicopters himself, does he? 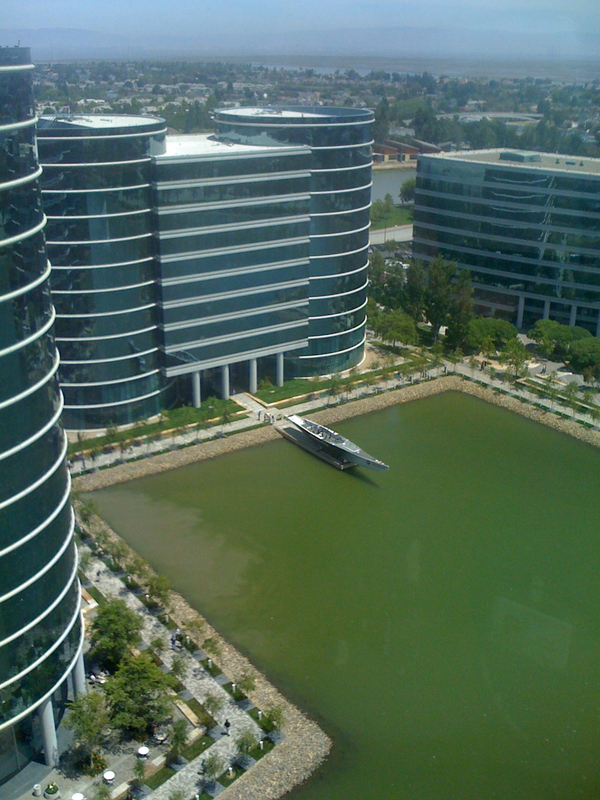 Am I the only person who thinks Oracle’s HQ buildings look like the “can” autoshapes used to represent databases on PowerPoint slides? Is this just co-incidence or deliberate design decision? I have no official confirmation – the generaly accepted theorie is they are database symbols or look like hard drives. I understand they are all fully Feng Shui compliant. You can see it on Google Earth here. Is the boat still there? Guess it is the first thing to check after you step into the office everyday. It is there, maybe because it is too big for the hall downstairs in the 500 building? Good to hear from you. The boat is still there, with mast up looking pretty impressive. I heard larru owns oracle’s HQ building and oracle pays rent to him for the same? I don’t know anything about the ownership of the HQ buildings. Not sure if other readers know anything.